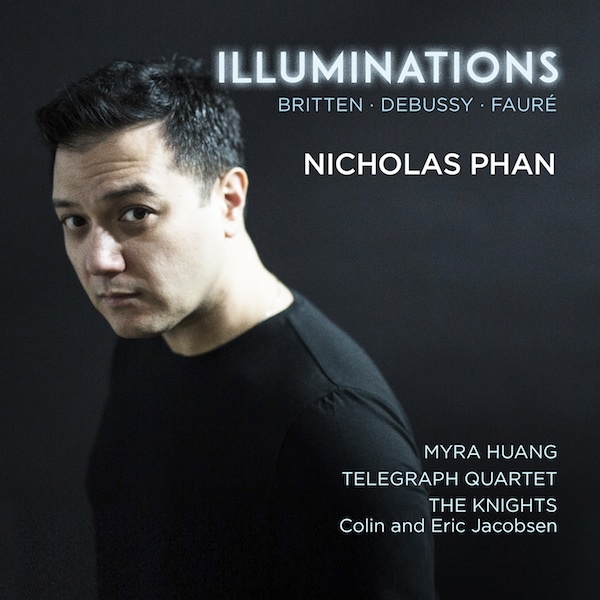 Following acclaimed albums devoted to Britten, baroque lute songs and German lieder, Grammy Award-nominated tenor Nicholas Phan continues to spread his wings with Illuminations, an album featuring compositions by Benjamin Britten, Claude Debussy and Gabriel Faure who were each inspired by the poetry of two nineteenth century French literary titans, Paul Verlaine and his protégé and eventual lover Arthur Rimbaud. The intertwined lives of the French poets and composers manifested themselves in Faures impassioned Verlaine-inspired La bonne chanson and Debussys Ariettes oubliees drawn from Verlaines Romances sans paroles. Just decades later Britten was inspired by Rimbauds influential prose-poetry Les Illuminations. "Nicholas Phan’s previous releases have shown him to be not only a fine singer but a fine programmer, too. His latest album continues the trend and juxtaposes three works – two to texts by Verlaine, one to a text by Rimbaud – that provide an unalloyed hour of pleasure. Phan’s own interpretations set the tone. Here’s a singer who puts music and words first, without ever resorting to the self-regard that surely must be a temptation in music as seductive as this...he sings with intelligence, sensitivity and poise, not to mention an appealing gentleness and patience." "Phan’s singing is both sultry and refined, accentuated by the equally subtle playing of his collaborators, pianist Myra Huang, the Telegraph Quartet and Brooklyn-based orchestra The Knights." "[Phan] brings an astounding range of colours and textures to bear on poetry which he clearly loves and knows inside-out. The Knights suit the action to the word, too, in a reading of Les Illuminations which brings Rimbaud’s ‘parade sauvage’ to vivid, unsettling life." "his singing is impeccably correct"
"Tenor Nicholas Phan makes a strong impression in these recordings of brief works by Benjamin Britten. Teamed here with the brilliantly incisive Knights Chamber Orchestra, he offers a searing, probing account of the composer’s early Les Illuminations, based on selections from the daring modernist poetic work by Arthur Rimbaud. Singer and instruments invest Britten’s daunting twisted, florid vocal lines with confessional bravado mixed with horror, an almost masochistic display that seems ideal in this musical enactment of Rimbaud’s evocation of a sojourn in a hellish modern metropolis that may be entirely in the mind." Illuminations was part of Nicholas Phan's solo recording projects, which is a sponsored project of Fractured Atlas, a non-profit arts service organization. Contributions for the charitable purposes of Nicholas Phan's solo recording projects must be made payable to “Fractured Atlas” only and are tax-deductible to the extent permitted by law.